An important interactive component of the installation of “AUNTSforcamera” at the New Museum includes a series of nine artist-devised tours, which have been organized using AUNTS’ chain-curation model. Nine artists have been invited by “AUNTSforcamera” artists to create a response to the exhibition in the form of a tour, which will be performed exclusively for and with participating audiences. Ben Van Burren was invited by Gillian Walsh. 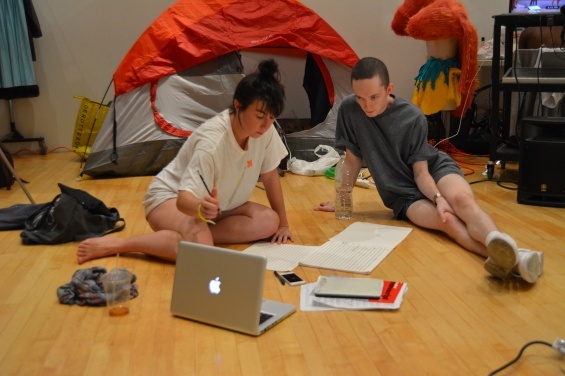 Walsh has used her participation in AUNTS events to develop material in a shared public workroom—outside the sanctity of the studio or theater. In Walsh’s Primary Source (video): AUNTS at the New Museum 2012, 2014 (2014), this practice becomes the subject of an intimate single-channel work that uses private videos as a form of primary-source personal archiving. Riffing on the institutional specificity that shaped Walsh’s work, Ben Van Buren has created an audio tour that aims to give the listener a better sense of the constellation of factors that make “AUNTSforcamera” possible. The tour investigates a number of (primary) sources on its quest to understand the dialogues and debates that both instantiate and complicate the creation and display of particular works of art.